4.4 out of 5 based on 138 bloggers and 19 commenters. 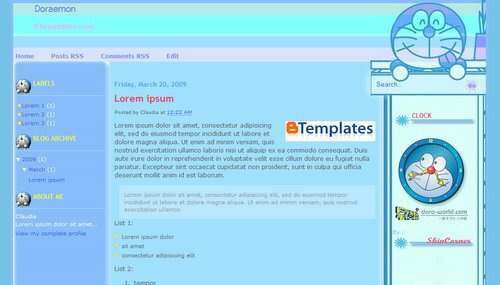 Doraemon is a free blogger template with 3 columns and left and right sidebars. Excuse me! Is there someone could help me to show the HTML for this template. It is so lovely, but I wonder why I still could’t get the HTML after downloading. TXH! Cool, I like it so much. I LOVE DDORAEMON even though im 60 years old! HAHAHHAHAA..
i love doraemon..thank’s for this templates..